Julian Lennon 50th birthday: How the Beatles kept John's son a secret. Brow Beat is following the Beatles in “real time,” 50 years later, from their first chart-topper to their final rooftop concert. 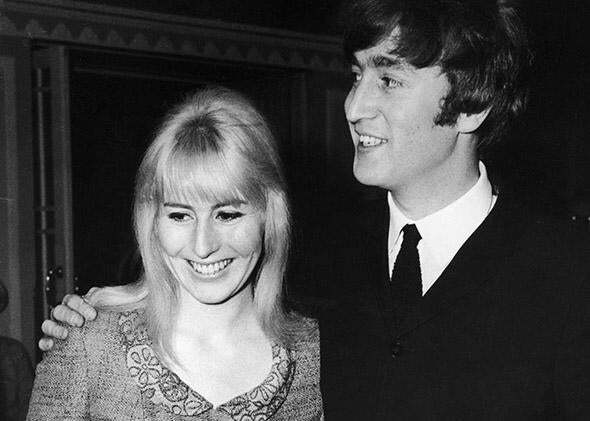 50 years ago this week, John Lennon’s wife Cynthia gave birth to their son Julian—but they kept the baby a secret. John Lennon’s son Julian famously inspired some of the Beatles’ greatest songs. When he was 4 years old, one of his pastel drawings for school inspired the title of “Lucy in the Sky With Diamonds.” When he was 5, his father wrote him a lullaby, which made it onto the White Album as “Good Night.” That same year McCartney was inspired to write “Hey Jude” for Julian—it was “Hey Jules,” originally—as his parents were going through a separation. But on April 8, 1963, when Julian was born, his parents were determined to keep him under wraps. John Lennon and his first wife, Cynthia, April 23rd, 1964. Beatles manager Brian Epstein was disappointed at the news. He had wanted to sell the Beatles as eligible young bachelors. (The Beatles still weren’t widely known, but he had seen the way their loyal fans reacted to them in Liverpool.) Still, he couldn’t very well kick John Lennon out of the group. Seeing no other option, he gave his blessing on the one condition that the Beatles keep the wedding, and the baby, on the down low. Once he’d gotten John’s assurance on that score, he did everything he could for him, even securing their marriage license and letting them stay at his apartment. There was a drill going on all the time outside … I couldn’t hear a word the bloke was saying. Then we went across the road and had a chicken dinner. I can’t remember any presents. We never went in for them. That evening, on Aug. 23, 1962, Lennon spent his wedding night playing with the Beatles in Chester. From that point on Cynthia lived what she called an “undercover existence,” leaving her wedding band at home and staying away from the band’s shows. She was even forced to deny her last name. On the rare occasions when John was home, they made sure not to go out in public together. This was made somewhat easier by the press’ ready compliance with their demands. Beatles biographer Bob Spitz points to the transcript of a fall 1963 interview conducted by Judith Simons of the Daily Express. Simons politely asks, “We still can’t mention your marriage, can we, John?” Asking was just a formality. According to Cynthia, a thought seemed to occur to him as he cradled the baby in his arms. “Who’s going to be a famous little rocker like his dad, then?” he said.